Having lived in Japan for three years and experienced much that mochi has to offer, this scene brought back the memories. 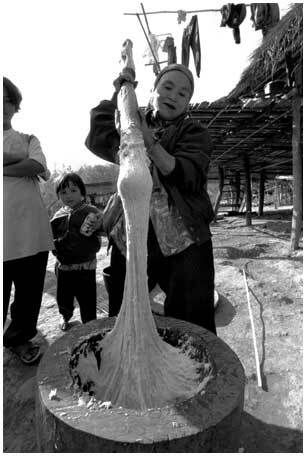 Like in Japan, rice is an important part of the diet here in Akha country, and there are various ways of preparing and eating it. This rice has been soaked in water for about half a day, then steamed for thirty minutes, and then processed like you see here. The resulting special food is called haw-nyaw. It is a traditional treat usually prepared for special days; before Christianity arrived here, the people made it for their holidays, and now they do for X-mas as well. 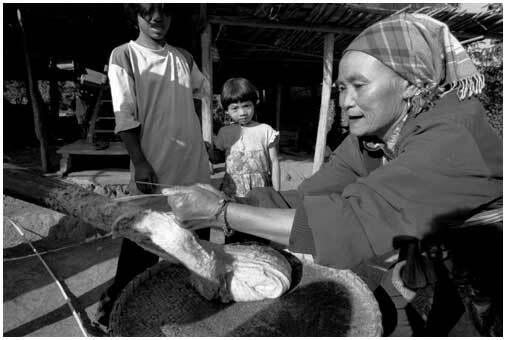 Below, this woman is using a length of string to help scrape the stick clean, and place the ball into a wicker basket. A brown spice has been mixed into the rice as it was pounded, giving it the appearance you see here. I don't know what the spice is, but it gives the riceballs a very "earthy" flavor. I'll try and find out soon what this spice is, and I'll let you know then! Apparently the best way to eat this concoction is fresh, as this little girl would probably tell you. 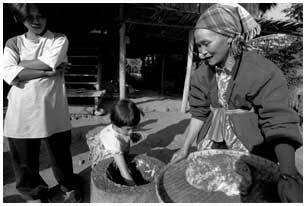 She is reaching into the barrel to take some of the dregs for herself, while the woman will take her portion back to her house for shaping. 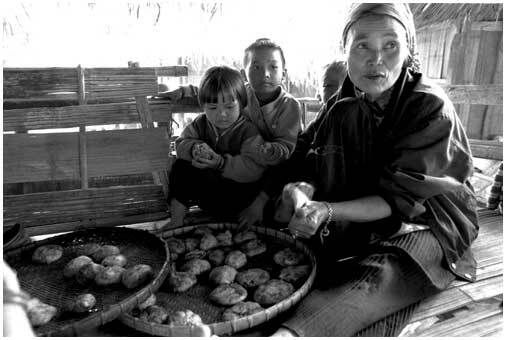 What struck me as interesting is how the children spend a lot of time with their grandmother here, watching and learning how to prepare this traditional meal.